Born in Suva, Fiji, in 1956, Kirsten has spent the majority of her life in Dunedin. She studied at the Otago Polytechnic School of Fine and Applied Arts 1974 – 76, majoring in painting in her final year. In 1981 she undertook a year’s study of Fine Art Conservation with Charles Lloyd (Fine Art Investment and Conservation). Working as an interior designer, she established her own consultancy in 1990, followed with the opening of a retail showroom, Kirsten’s Design and Furnishings, in 1992. She ran this business until 2008. Her years of work as an interior designer had a profound influence on the development of her paintings which reflect her love of pattern, colour, shapes and detail. She greatly admires Trish Guild who is renowned for the extraordinary combination of colour and pattern in her Designers Guild furnishing collections. She also has a long standing love affair with the creations of Erte, the Art Deco designer and painter. Such brilliant and gorgeous flights of fantasy! Travel has also been a great influence on her work providing the inspiration for two of her three solo Dunedin exhibitions, ‘Sari Grace’ and ‘Pieces Of India’. Spending a year cycling overseas in 2012 also heightened her awareness and appreciation of the natural beauty of New Zealand and since moving to Nelson in 2013, She is increasingly introducing native flora and fauna into her work. 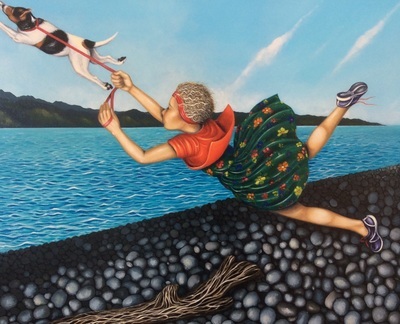 This can be seen in ‘Marie Antoinette’, ‘Yoko Ono’ and ‘Frida Kahlo’ where she explores the idea of placing women of renown out of context in New Zealand settings where they interact with our own unique wildlife. Her later works have been described as original, whimsical and surrealistic.